Let’s face it, we’re not breaking any new ground here with this piece. If you haven’t figured out by now which foods go hand-in-hand with football, particularly the “BIG GAME,” you know….. the Super Bowl, you probably don’t partake much in the festivities that go along with it. The Super Bowl is easily the most watched sporting event in the United States annually. Each year two of America’s best football teams go head-to-head culminating the 16-week season and post-season games. Along with the game go the ever-popular comedic commercials and the sometimes questionable performances at the Half-Time show. But what really gets the fans going at home is the food. Sure there are the traditional pizzas and chips that get the job done, but what are some of the “Go To” foods that those cooking at home like to make? I’m going to review the Top Five items I’ve made in the past and will likely make again come game time on Sunday. Before we dive in to the food, reflect back on our Top Five Beers to Enjoy While Watching The Fights article. The list is easily transferable to the BIG GAME on Sunday as it covers a variety of light refreshing beers. Also, don’t forget to check out UFC Houston the night before the game. Do yourself a favor and buy enough beer to last you through both events. One more with a shameless plug to find me on Untappd. Untappd is a geosocial networking service and mobile phone application that allows its users to check into beers as they drink them, and share these check-ins and their locations with their friends. Untappd includes a functionality that allows users to rate the beer they are consuming, earn badges, share pictures of their beers, review tap lists from nearby venues, see what beers their friends are drinking, and suggests similar beverages. In a medium mixing bowl, add all the ingredients, except the chips, and mix well. Transfer to a 9 by 9-inch foil baking pan and cover with aluminum foil. Put on the grill over indirect heat (350 degrees F is ideal) and cook for 15 minutes, turning every 5 minutes, to keep the heat even. Carefully remove from the grill and serve with the chips. 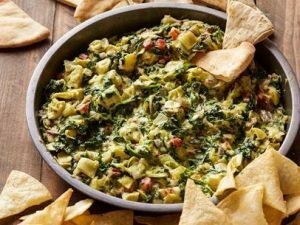 Cook’s Note: The dip can be prepared in advance and kept in the refrigerator until ready to cook. If this is done, please add 10 minutes to the cook time. You can broil these in advance, then reheat them on the grill. Preheat grill to medium-high. Or preheat the broiler. Wash the jalapeños and cut in half lengthwise. Remove the ribs and seeds; set aside. In mixing bowl, mix together cream cheese, meat and ½ cup of the shredded cheese. Stuff jalapeños with the mixture. Sprinkle with remaining ¼ cup cheese, lay half a bacon slice over the pepper and secure with toothpick. Place the stuffed jalapeños on the grill or under the broiler. 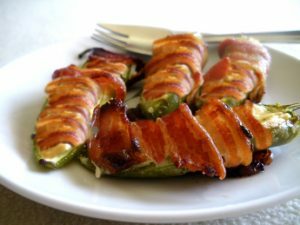 Cook the jalapeños until the bacon is cooked through and just crisp, about 10-15 minutes, and serve. Combine water and bulgur in a small bowl. Let stand 30 minutes; drain. Combine bulgur, beef, and next 8 ingredients (through olive oil) in a large bowl; gently mix with hands until thoroughly combined. Cover and chill 45 minutes. Shape into 39 (1-inch) meatballs. Preheat oven to 425°F. 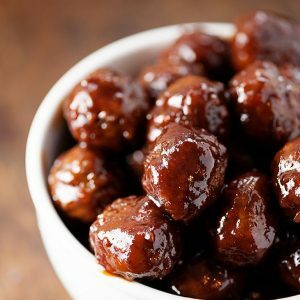 Arrange meatballs in an even layer in a 13- x 9-inch baking dish coated with cooking spray. Bake in preheated oven until lightly browned and cooked through, about 15 minutes. Meanwhile, bring grape jelly and the remaining ingredients to a simmer in a small saucepan over medium heat, and simmer for 5 minutes. Remove from heat, and let stand 5 minutes. Place meatballs in a large bowl. Add the jelly mixture; toss gently to coat. Serve immediately. In a large skillet, brown the ground beef. Drain well. 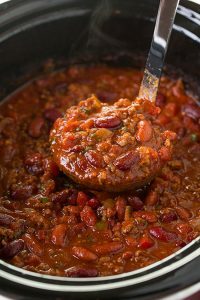 Combine all ingredients in a slow cooker, cover, and cook 7 to 8 hours on LOW, or until done. Serves 6 to 8 people (or 1 really hungry person). For me hot wings are a necessity. No matter where I go or when I am there, every trip requires me to try the local flavor of wings. It’s just something I do. Wings are traditional bar food and for me, the hotter they are, the better. Wings equal happiness and there are literally thousands of ways you can prepare your happiness, but for the sake of this article I am going to stick with traditional buffalo. Enjoy! 1/4 cup hot sauce – Franks RedHot Sauce Original is one that a lot of people like. I personally like it hotter but that’s me.